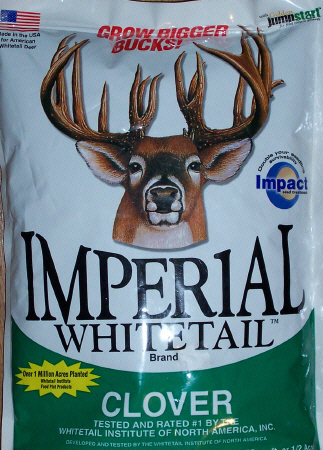 Imperial Whitetail Clover 1 lb plants 1/8 acre or 5445 sq ft.
Imperial Clover is a professionally formulated blend of high yielding clover varieties that offers very unique traits when compared to traditional plantings for wildlife. Wildlife biologists now know the critical importance of high-quality forage and browse for whitetails year-round, especially during the spring and summer months of antler growth and fawn development. Without high-quality, high-protein browse during the antler-growth season, a buck's antlers will not reach their genetic potential.